Together with global warming, the pollution caused by the nuclear industry may create the “perfect storm” leading to a catastrophic extinction level event (ELE), if it has not already begun to do so. Scientists from U.S. intelligence agencies, the National Oceanic and Atmospheric Administration, the National Science Foundation, and the National Academies are now warning that abrupt climate change may lead to the end of most life on earth. Massive use of fossil fuels to create the nuclear industry’s infrastructure and to mine and process uranium used in the “nuclear cycle” only contributes to this problem of global warming. Nuclear waste, the most highly radioactive and therefore the most dangerous component in the nuclear cycle, exacerbates the industry’s devastating effects on the climate. It is not easy to know what is happening inside the Fukushima Daiichi nuclear power station. Both the Tokyo Electric Power Company (TEPCO) and the Japanese government have been less than candid about events both before and after the March 11, 2011 catastrophe. The news media in Japan have a long history of being part of what Japanese call their “nuclear village,” the complex of government, industry, academia and the media that supports nuclear power. The media’s pro-nuclear bias dates back to the post-war years when media tycoon Matsutaro Shoriki, used by the CIA as a trusted messenger, supported the nuclear industry in the US and Japan. Shoriki was as responsible as anyone for “selling” nuclear power to the people and in hiding its deleterious effects. The Japan Scientists’ Association, Japan’s mass media companies, citizens’ associations, lawyers’ organizations and some regional legislatures have joined them, and polls show the public also decidedly opposes this attack on democracy. The ruling parties remain adamant, though, citing “national security and fighting terrorism” as excuses. Not only has the government failed to tell the Japanese people the truth about the radiation from Fukushima, but Japanese Prime Minister Abe and the International Atomic Energy Agency (the IAEA) have been trying to restart nearly 50 nuclear power plants in Japan that were shut down in the wake of the Fukushima disaster. Both Abe and the IAEA have told the Japanese people that the amounts of radiation to which they were exposed and are still being exposed by the disaster are not worrisome. At the same time, Japanese schoolchildren are being told that cancer is a national disease in Japan, and that one in four of them will succumb to it. Claiming it did not want to create panic, the Japanese government did not distribute iodine pills to the most vulnerable segments of the population in March 2011, pills that would have prevented the uptake of the radioactive isotope of iodine emitted by the stricken plant. Iodine is used by the thyroid gland, and already Japanese children have much higher rates of cancer as a result of their exposure to Fukushima’s radioactive iodine. In January, the Wall Street Journal reported, “Reactors 1-3 are so highly contaminated that no one, even in a protective suit, can enter the buildings. That means almost all the cleanup work at the three units will have to be undertaken by remote-controlled robots” (WSJ, 14 Jan 2014). One of the most serious problems workers have had to face has been leakage of the water used to cool the cores. It has become apparent that radioactive water is making its way to the Pacific Ocean. To solve the problem, TEPCO is planning to build a massive, frozen wall around the plant, using liquid nitrogen to freeze the soil. This wall will have to be kept cold indefinitely; at Chernobyl, the plan to use liquid nitrogen was abandoned. Furthermore, groundwater is backing up, and TEPCO has put steel plates on the ground to shield workers from the radiation. Meanwhile, the temporary storage tanks are rusting, leaking well in advance of their 5-year rating, and making the ground nearby too radioactive to work. Russia has accused the Japanese government of not accepting help in this project, and Russian scientist Oleg Dvoynikov warns that even if the soil around the plant is totally frozen, the danger will not be completely eliminated. Not only the Japanese people were exposed to high levels of radiation. American sailors on the USS Ronald Reagan at sea off the coast of Japan sailed into the plume of radiation emitted by the Fukushima Daiichi plant and then were ordered to help the Japanese with the disaster. They, too, were not issued iodine tablets, and are now suing the Government of Japan as they now suffer increases in thyroid cancer and other illnesses due to the radiation to which they were exposed. Harvey Wasserman, a longtime anti-nuclear activist and member of the Green Shadow Cabinet, is circulating a petition in support of the sailors. The grievances of the American sailors are nearly as bad as those of the workers who are tasked with cleaning up Fukushima. As if risking their lives to work in the highly radioactive environment were not enough, these men, many of whom were homeless, are preyed upon by Japanese gangsters, the notorious Yakuza. The bonuses paid by the government for labor in the plants are skimmed off by the gangsters, and the workingmen suffer from poor housing, food, medical care, and, most importantly, in how they are protected (or rather, not protected) from the radiation which inevitably will cause them grave, even fatal, harm. The effort to clean up Fukushima is complicated by the fact that workers have a maximum allowable dose of radiation each year. To get around this, supervisors routinely tell employees to take off their dosimeters. Laborers from the poorest of society are called “nuclear gypsies” (genpatsu jipusii), because they move from job to job, which also enables TEPCO to evade restrictions on the amount of radiation workers can accumulate. Abuse of personnel adds to the many problems TEPCO has in controlling the radiation at Fukushima, not the least of which is slipshod work, such as the use of duct tape to provide barriers to radiation. More importantly, though, exploitation of workers adds to low morale, already a problem. There is increasingly a shortage of skilled labor in the plant. But even as Fukushima continues to spew radiation, Prime Minister Abe has been seeking to export nuclear technology. A proposed India-Japan nuclear deal, though, is controversial in Japan, as the Japanese, mindful of their heritage as the only nation to have suffered nuclear warfare, want to restrict testing of nuclear weapons, which India possesses. And in spite of all the problems it faced at Fukushima, the Japanese government successfully bid for the 2020 Olympics, with Abe blandly assuring the world that everything was under control in Fukushima. Nevertheless, there are some influential voices in Japan who are speaking out against nuclear power plants. Japan’s popular former Prime Minister Koizumi Junichiro is one of them. Koizumi is far from alone, and it seems that many of Japan’s former prime ministers support his stance. Everything from a massive, unexplained die-off of starfish to observations by ocean travelers that the Pacific seems devoid of life has been blamed on radiation from Fukushima. Scientists have documented unusual thyroid cancers among Alaskan sea mammals. There are fears that radiation from Fukushima will infect produce from California, a major source of fruits and vegetables nationwide, and countries to the west of Japan—Korea and China—are deeply concerned about the impacts of radiation on their own fishing industries. Some Californians are taking matters into their own hands. Since the federal government stopped monitoring radiation on the West Coast shortly after the Fukushima disaster (with the excuse that the monitors didn’t work), Californians themselves are now watching the levels of radiation through such projects as Kelp Watch 2014, SafeCast.org and RadCast. At the same time, experts Arnie Gundersen and Ken Buesseler, whose previous statements raised public concerns about Fukushima, have tried to quell fears about the magnitude of the threat to people on the West Coast. These scientists now say that swimming in the ocean and running along the beach pose little risk at present, and Gundersen has pointed out that no place on Earth is free of threats posed by radiation as well as other hazards. This seems to be in answer to a widely reported comment by Dr. Helen Caldicott that if the spent fuel pools in Reactor Number Four at Fukushima collapse, she would move to the Southern Hemisphere. Few scientists in the relevant fields are independent from the government, and able to comment freely in public on radiation’s effects, but it is clear that the magnitude of the disaster at Fukushima equals the disaster at Chernobyl. 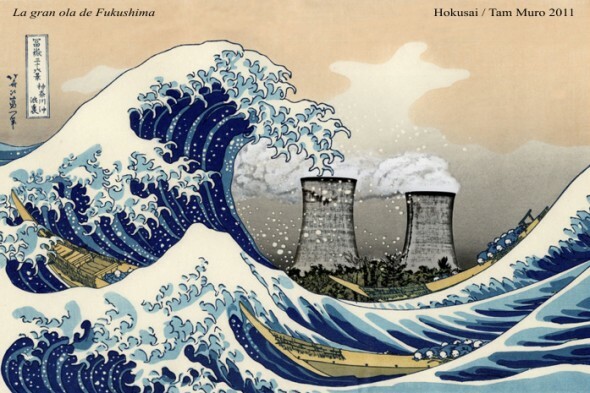 Despite desperate and heroic efforts by thousands of Soviet workers, many of whom later died, Chernobyl irradiated the soil of Ukraine, and the atmosphere in Europe and the entire Northern Hemisphere; Fukushima is on track to pollute the Pacific Ocean. The hastily built, poorly constructed water storage tanks at Fukushima are not a permanent solution, and a frozen wall may prove too costly, so the Japanese government and TEPCO have openly discussed discharging their contents into the ocean. Claims that the Pacific Ocean will dilute the radioactive substances in the water have been countered by scientists who point out that any level of radioactivity is harmful to living organisms. “Apologists say it’s a large ocean and dilution is the solution to pollution,” said Daniel Hirsch of UC Santa Cruz, who studied cancer among nuclear-power workers in the 1990s. “Dilution actually does nothing except expose a larger population.” According to Gundersen, the Pacific is becoming more and more contaminated from Fukushima. Does Japan have the money and political will to stop that? SOURCES: Excellent information continues to be published out of the public eye and in spite of government (American and Japanese) obfuscation.
. Cecile Paneda’s Devil’s Tango: How I Learned the Fukushima Step by Step is a great read, and lists more sources for this evolving tragedy.
. Brian Covert’s article in Project Censored, “Fukushima: An Update from Japan,” is an excellent source on Matsutaro Shoriki.
. “Nuclear Ginza,” old but still valid and accessible on YouTube, exposed the plight of the workers in the Japanese nuclear power industry.
. Other sources included the Asia-Pacific Journal, ENE News, washingtonsblog.com, commondreams.org and Fukushima Response-Bay Area. Many thanks are due to the latter for their valuable input. Any errors are mine.